Describing the Principle: There are many designs used on engine camshafts. The correct camshaft will play a direct role in the efficiency of the engine as well as the overall operation of the vehicle. Therefore, the contour of the camshaft is extremely important. The contour of the camshaft lobe determines when the intake and exhaust valves open and close. The contour also determines the speed and amount of valve opening, and the speed of closing the valves. The drawing on the left shows the design and associated terms of a typical camshaft lobe. Looking at this diagram, the lift determines how far the valves will open. The duration determines how long the valves will stay open. 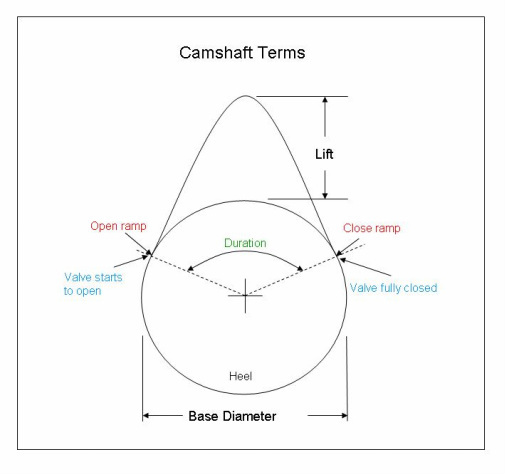 The shape of the cam lobe from the open ramp to the close ramp, determines how fast a valve will open and close. The lobe can have many shapes depending upon the purpose of the street rod such as casual driving verses performance operation. When ordering a camshaft, the camshaft manufacturer will ask a series of questions such as how the engine is going to be used, the weight of the vehicle, the type of engine, the compression ratio, the type of transmission, the tires sizes, the differential ratio, and many more. All of these items (and others) play a role in the exact design of the lobes of the camshaft.